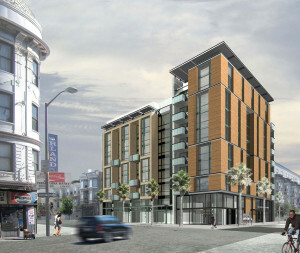 SAN FRANCISCO, CA – Mercy Housing California (MHC) announces that construction has begun on a nine-story structure at 200 Sixth Street, at the corner of Howard Street. It is the site of the former Hugo Hotel. 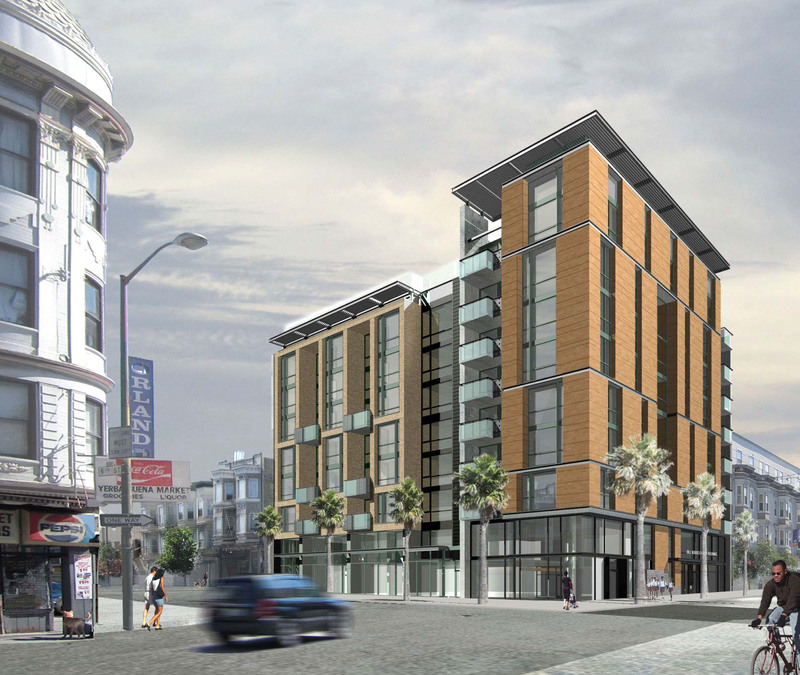 When completed, the property will be named after long-time social and economic justice activist and San Francisco native Bill Sorro, who died in 2007. The Bill Sorro Community will be comprised of 67 units of affordable family housing: eight studios, 24 one-bedroom, 25 two-bedroom, and 10 three-bedroom apartments. Fourteen of the units will serve low-income adults with developmental disabilities and are being financed using the HUD 811 program. The remaining 53 units will serve low-income families with incomes between 40% – 50% of AMI (area median income). The ground floor will be comprised of approximately 2,315 square feet of neighborhood-serving retail space. Before its dissolution, the San Francisco Redevelopment Agency selected MHC to redevelop the property, empty since a fire burned the Hugo Hotel’s interior in 1988, and notable as the location of Brian Goggin’s “Defenestration” art installation, which was removed in 2014. The Arc of San Francisco will provide services for the residents with developmental disabilities living in the HUD 811 subsidized units. Also, the project will provide the South of Market Child Care Center with a Sixth Street satellite location for their Family Resource Center, which will provide parenting classes and family case management to South of Market Area neighborhood residents. For the commercial spaces, the prominent corner space is planned for a high quality restaurant that will provide moderately-priced ethnic cuisine. The land and building were purchased and contributed by the former San Francisco Redevelopment Agency (now the Office of Community Investment and Infrastructure). Mercy Housing California (MHC), with a 34-year presence in San Francisco reflected in its 32 housing developments for families, senior, and persons with special needs, is the largest regional division of national nonprofit Mercy Housing, Inc. (MHI), a developer of affordable housing and the largest nonprofit affordable housing owner in the country. Mercy Housing’s mission is to create stable, vibrant, and healthy communities by developing, financing and operating affordable, program-enriched housing for families, seniors and people with special needs who lack the economic resources to access quality, safe housing opportunities. Statewide, Mercy Housing California has developed more than 123 rental properties across 36 counties. Through the provision of safe, service-enriched housing, MHC strives to strengthen families and build healthy communities. For more information, please visit www.mercyhousingcalifornia.org.